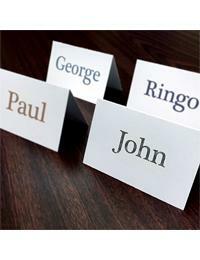 Our customizable PrinTable Place Cards ™ are an elegant way to display names, products, and other information. Their small size makes them perfect for gift tags and place settings. These cards are very easy to use. 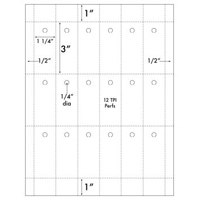 Print on the 8.5” x 11” sheet, tear along the micro-perforations, and then fold each card in half along the pre-score – no extra edges to tear away! 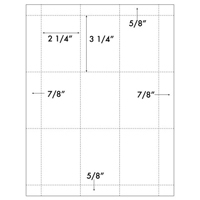 The cards are made of bright white, sturdy cardstock, and measure 4.25” x 2.75” when folded. 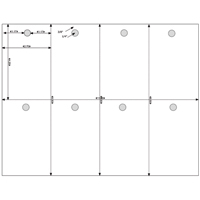 Mini tent cards are available in quantities of 250 sheets, with four cards per sheet. Personalize your own cards with our free downloadable template! 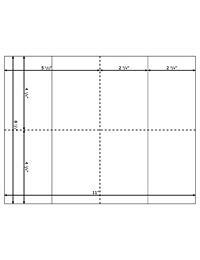 Note Card Size (Folded): 4 1/4" X 2 3/4"